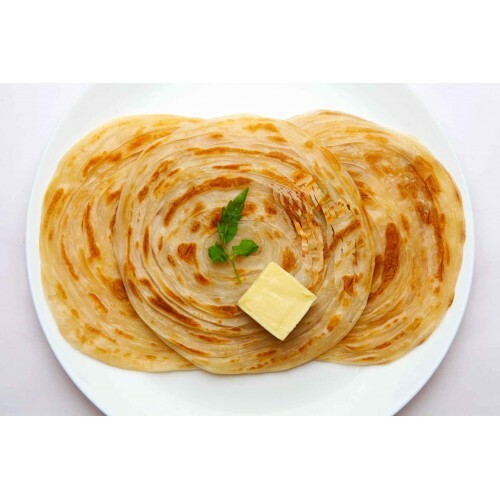 Kerala parotta, porotta or barotta is a layered flatbread made from maida flour, from the culinary tradition of southern India, especially in Kerala. This bread is completely different from the north Indian paratha,. At some places it is also served at weddings, religious festivals and feasts. It is prepared by kneading maida, egg (in some recipes), oil or ghee and water. The dough is beaten into thin layers and later forming a round spiralled into a ball using these thin layers. The ball is rolled flat and roasted. Usually, parottas are eaten with vegetable kuruma or chicken, mutton or egg roast/curry. Chilli parotta and kothu parotta are prepared using parottas. Maida is kneaded using egg, oil or ghee, and water. The dough is beaten into thin layers and then formed into a round ball.